Cisco devices offer excellent features for traffic filtering. The classic Access Control List (ACL) is the core mechanism on Cisco network devices (routers, switches etc) which is mainly used for traffic filtering. In this article we will examine a different type of ACL, called the Vlan Access Control List (VACL) which works a little different from the classic ACL. In any network setup you need to have full control on traffic that enters and leaves your network. Most of the times we use filtering to permit or deny specific routed traffic from one Layer3 subnet to another Layer3 subnet. Usually this type of filtering is controlled by ACLs which filter routed traffic (i.e traffic between different Layer3 networks). What if we want to control traffic flow within the same VLAN (and hence, within the same Layer3 network)? This can be achieved using a VACL which can block or permit traffic flow within the same VLAN. Traffic filtering on a Layer3 switch using classic ACL for traffic control between layer3 networks. Traffic filtering on a Layer3 switch using Vlan ACL (VACL) for traffic control within the same layer3 network (vlan). For more information about Layer3 switches and inter-vlan routing see this post HERE. Standard ACL: Contains only source IP address. Extended ACL: Contains both source/destination IPs and ports. *filtering can also be done using prefix-lists and route-maps but it’s not the objective of this tutorial. In this first simple ACL filtering example, the requirement is to block telnet traffic from Host1 to Host2. To achieve this, we will use an extended ACL applied inbound on one of the Switch VLAN Interfaces (SVI) (vlan 10) of the Layer3 switch as shown below. As shown above, we have connectivity between the two hosts. To demonstrate how you can use ACL filtering, I will block the telnet session from Host1 to Host2 using an ACL applied inbound on the SVI interface for VLAN10 of the switch. An ACL applied inbound on the SVI interface (interface vlan 10) blocks traffic coming from hosts connected to VLAN10 ports towards the switch. Configuration on the switch that will block telnet from Host1 to Host2. As you can see, telnet traffic has been blocked. An ACL is using source and/or destination IPs and ports to directly match packets that are to be filtered. 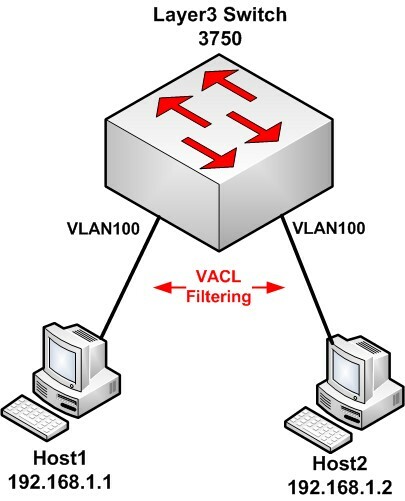 A VACL on the other hand is used in switched networks where you want to filter traffic within the VLAN. VACLs are similar in logic with route maps but instead of “route-map” entries they contain “access-map” entries. Each “access-map” entry contains a match statement (using a normal ACL) and forward or drop actions accordingly. You can have different matching statements for every access-map sequence and they will be processed in the order they are entered. Just like a normal route map, there is an implicit deny-all statement at the end so make sure to create a final access-map entry which permits all other traffic. As shown on the diagram, we have two hosts in the same VLAN 100 (and same Layer3 subnet 192.168.1.0/24) connected on the same Layer3 switch. We want to restrict telnet access from Host1 to Host2. Configure an ACL to match telnet traffic from Host1 to Host2. The configuration above might look confusing. The ACL in Step1 contains a “permit” statement for telnet traffic between Host1 to Host2. This DOES NOT mean that we permit telnet. The “permit” statement is used to match telnet traffic from Host1 to Host2 and then drop that traffic inside the VACL access-map with the “action drop” command (see Step2). Very nice example. But I think I could get the same result with the following ACL? Do you mean to use the suggested access-list 100 as a matching ACL for the VACL access-map? If you mean to use a normal ACL directly for blocking traffic within the VLAN, it won’t work. You must use a VACL to block traffic within a VLAN. Looks great. I love to see functional examples like this to work from. Is there a way to take this one step further and prioritize specific traffic to do traffic shaping within the VLAN? I haven’t tested it with traffic prioritization. It depends on the switch model and what features it supports. On 6500 switches, VACL has more capabilities.